My name is Maryam. I am of Bulgarian national and have been living with my family in the UAE for the past 15 years. Besides my full time job, I enjoy spending every free minute working on new projects or just reading for the new trends in the quilting and crafting world. Tell me about Handmade Creations and how it all began. After covering all the beds for my family with bed sheets and quilts, I began making similar items for relatives and friends. One evening during one of our family gatherings, someone mentioned that I have to try and start my own business. It was only then, back in 2014 when the idea and initial thought of launching Handmade Creations was born. However, there was no name in mind at this point, but the idea was slowly starting to occupy my thoughts, and I started doing some reading of successful stories of other crafters and getting some ideas. Coming up with the name was a difficult task, as nothing was good enough. Perhaps this is the time to mention that I’m quite critical and demanding towards myself when it comes down to something done by me, whether it is making a quilt, or bed sheet set, just a simple handbag, selecting a name or even preparing for a business meeting for my work. Unless the outcome is perfect according to my own understanding and knowledge, I don’t settle down and don’t pass it on. There are many similar names out there for other craft businesses but even though it might be hard to stand out amongst the rest, the name was exactly describing what I do- as everything is created by my two hands and my sewing machine only. However, despite my creativity when it comes down to quits and the endless design possibilities that I see when I’m given a certain colour scheme, I’m quite weak in creating marketing collateral. In this area I need help and that’s why I contacted a creative company that I know from my regular job to help me. Having a heart as a main logo design was something that I decided long back because the passion for what I do comes from my heart, and therefore everything else that gets completed. Yet, because I’m creating mostly for kids, I wanted this to be recognized when someone sees the logo for the first time- this is where the many colours come into place. Seeing the finished product, washed (all quilts are washed before heading to customer’s house), packed and ready to be delivered is definitely a blast. But the most rewarding part is getting feedback from my customers. Knowing that I managed to create and deliver what they had in mind and being able to see the design through their eyes, is what keeps me going. I am proud to say that so far I have managed to satisfy and make happy all my customers. It is well know that quilting is an expensive hobby as you need a lot of specialized tools as well as the right materials. Your design might be perfect, but if the fabric and the batting (wadding- middle part of the quilt) is not good, the quilt will be ruined. I would say that the most challenging aspect is to outsource all materials at very reasonable price and to lower the production cost as much as possible in order to keep the selling price very affordable. This is on-going process and I’m constantly exploring new suppliers. 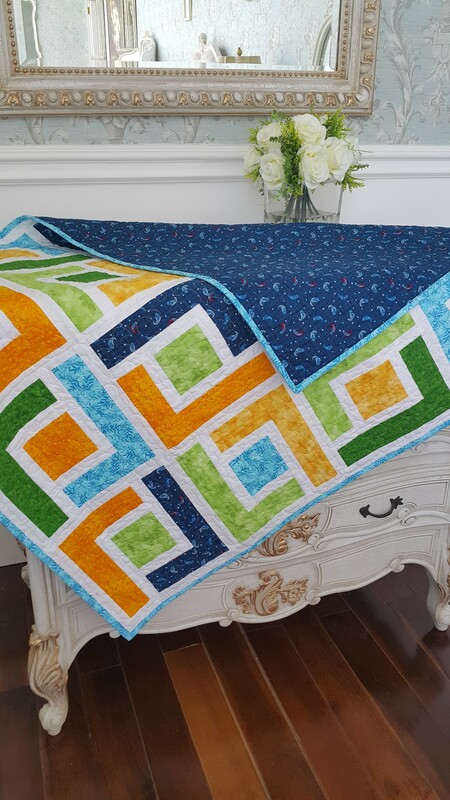 On other hand, quilting is not so popular in this part of the world and sometimes I feel is a drawback, as those who never touched handmade quilt might be hesitant to order. However, I am trying to create exposure via various channels and bring more awareness to the mums and soon to be mums. What materials do you use for your quilts and where do you source them from? I use 100% cotton for the top and bottom of the quilt and cotton batting for the middle. The batting that I use is soft, drapable and holds up perfectly after several years of washing, which make it ideal for a child’s quilt. It is manufactured by one of the best world companies specialized in quilting products. What’s been your most interesting commission to date? I get my inspirations from online craft blogs, books, exhibitions and most important my customers- I always listen to them. Many times I will be asked to make something that I wouldn’t think of, but this doesn’t stop me and I will give it a go. In those cases the best designs are created. What is the unique trait about your quilts? My slogan is “ Your color…. Our Imagination” and I think this is what makes my quilts unique. 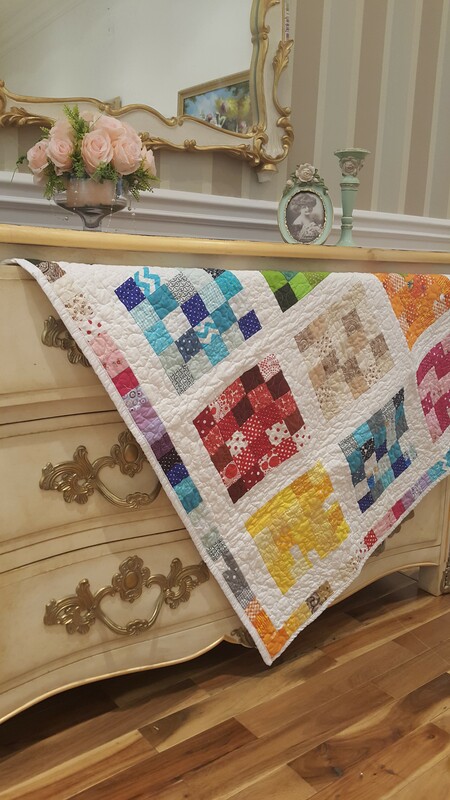 The basic of quilting is simple- choose a block design and connect the blocks together. 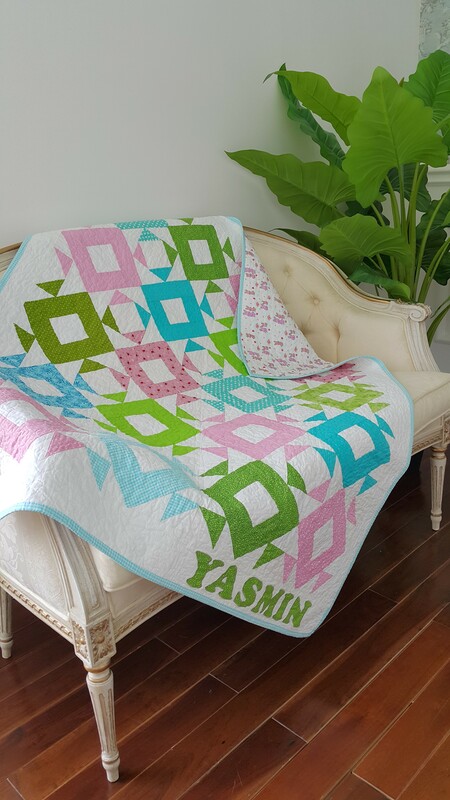 There are a lot of quilt patters telling you which color fabric to use and how to combine the colours in order to get the final look. I don’t use that fabrics/ color instruction, that’s why “your color…. our imagination” lead to creating the perfect quilt and this is my secret to uniqueness. In other words, the unique trait of my quilts comes from the customer’s itself. Tell me about a day in your life, as the owner of Handmade Creations? My day or should I say- my night as owner of Handmade Creations starts after I get home from work. If I have custom order I use the evening hours and weekends to work. However, there are moments when I’m “free” from quilting and this is the time to catch up on family and friends or just to browse and get new inspirations on how to upgrade my business and bring it to the next level. Would you ever want to branch out and design other accessories/clothes, or are you happy solely designing quilts? I have considered designing handbags but that would be some time in the future as for the moment, I want to focus on quilting and increase the range of products available from personalized patchwork quilts, memory quilts made from baby’s cloths to table and bed runners and expanding the business in that direction. Listen to your heart, you know deep inside what your strength is and what you are capable of. Don’t let other successful businesses intimidate you. Remember they also started from “0”. No one said it will be easy or that the success will come over night. Believe in yourself, have the passion and follow your instincts, then you will know what to do. Well, that is a simple and at the same time very complex question. 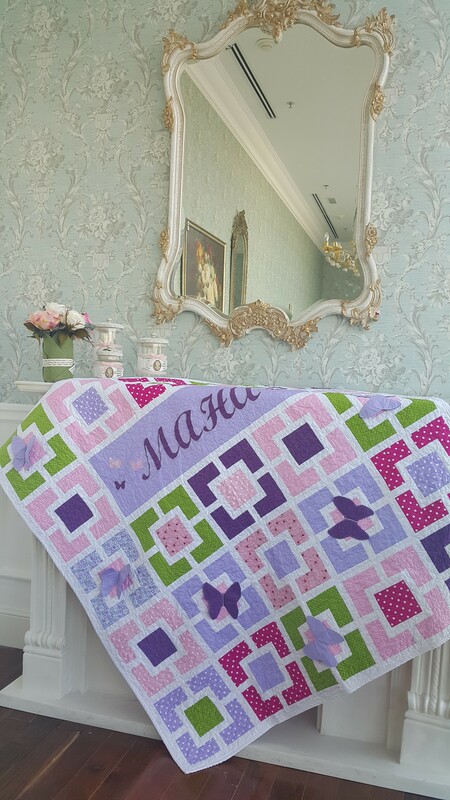 I would like to have my quilts available in some of the leading baby boutiques in UAE and at the same time have my own online shop where I can display all my makes. 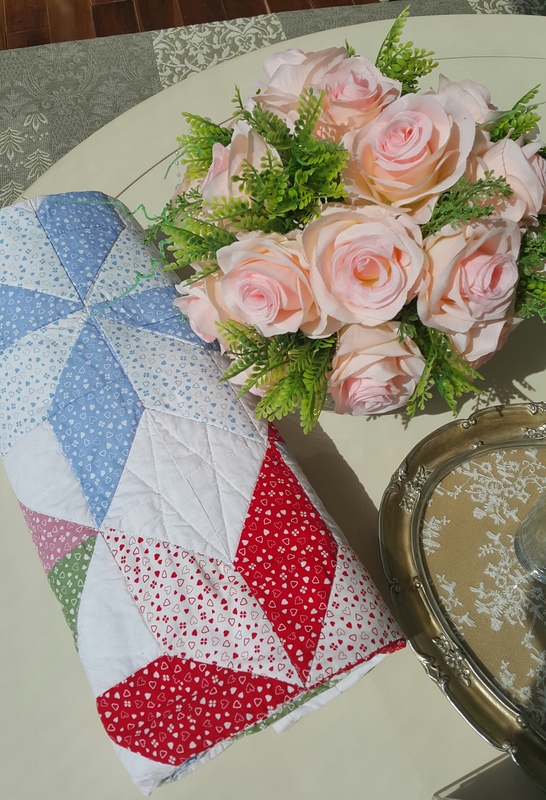 I would like for the mums to consider my quilts as the most welcome gifts that are truly original and stand the test of time and reach out to customise their own. 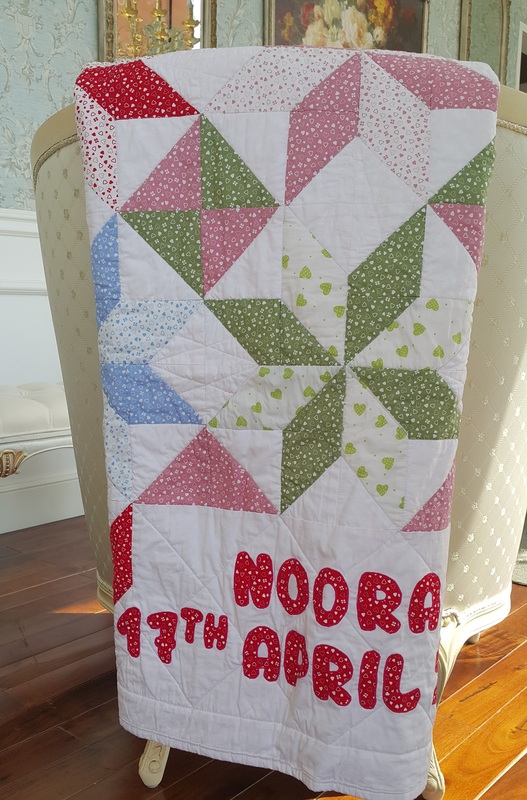 If you are interested in having your own personalised cotton quilt, contact Maryam via email or through the Handmade Creations social media as linked below. All photographs in this post are the property of Handmade Creations, and have been used by the owner’s permission. The quilts are so pretty! Very creative and a great post. They really are so colourful and gorgeous! Makes the perfect gift for a new born! You’re doing a great job with ‘Local Flair’. Products covered are unique and interesting. Always good to know about them. Quilting is such a beautiful art! I wish more people would take up this hobby. I’d like to learn it too, but don’t think I have the patience. Haha Me neither! But it is indeed very beautiful! Yes, so pretty, aren’t they?